If I had a dollar for every time someone asked how I wound up traveling through Central Newfoundland, I’d have a tidy little sum piled up in just a few days. 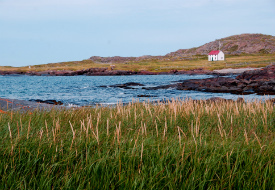 Indeed, this region of Canada – part of the province of Newfoundland and Labrador that lies northwest of the port city of St. John’s – tends to get overlooked on tourists’ itineraries in favor of hotspots like Montreal and Quebec City and the more well-known coastal regions of British Columbia. It’s a destination well worth a trip, though, especially for adventure-seeking travelers, as the area is loaded with off-the-beaten path opportunities for exploration on both land and sea. Hundreds of miles of spectacular hiking trails, boasting unforgettable names like the Squid Jiggers Trail, crisscross the rocky terrain. Tour boats take visitors in search of migrating whales and mighty icebergs. And, as I discovered from a recent visit, the area is also home to Canada’s version of the Loch Ness Monster: a mysterious, eel-like creature that’s said to live in the murky depths of Lake Crescent. Like most visitors to this area, I had no idea beforehand about “Cressie,” as she's known. Turns out, a centuries-old legend in the tiny town of Robert’s Arm, about an hour's drive from Grand Falls-Windsor, tells of a large, serpent-like creature that has reportedly been sighted numerous times in Lake Crescent over the years. I spent several hours exploring the area and hoping for a glimpse of Cressie, but no such luck. I was equally unlucky spotting a whale during a boat tour in the charming town of Twillingate. The town dubs itself as the Iceberg Capital of the World, as it has front-row seats for the massive ‘bergs as they break off from Greenland and float through a channel known as iceberg alley, and it’s prime whale-watching territory, too. But even if, like me, you come up empty looking for icebergs and local creatures (imaginary or not), it’s impossible not to hit the jackpot with Central Newfoundland’s abundant hiking trails. Nearly every town has its own information center (often called an interpretation center) stocked with well-marked trail maps and helpful staff. On the tiny islands of Change and Fogo, both accessible by ferry from the aptly named Farewell, there are enough hikes to fill a multi-day itinerary. One not to miss on Fogo is the Brimstone Head Trail, which, according to the Flat Earth Society, is one of the four corners of the world – offering some great photo ops thanks to the views and signage. 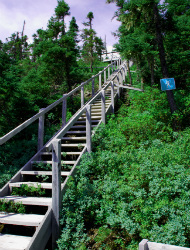 Further west, in the town of King’s Point (also home to King’s Point Pottery, a fantastic pottery studio and gift shop), the Alexander Murray Hiking Trail (in the photo above) is another highlight for avid hikers. This trail covers a whopping 2,200 stairs over an 8-kilometer loop, featuring spectacular views of the surrounding landscape as well as nearby waterfalls. Hike counter-clockwise for a more rigorous workout, and watch out for moose (and occasionally caribou) that are common in the area and can sometimes charge hikers, especially during their rut in the fall. What you won’t find on most trails, however, are tons of fellow hikers. I only encountered four people total on three separate hikes – a welcome change from the often-crowded trails of the United States in the summertime. Start planning your next trip with our Canada destination guide, then use our Travel Search price comparison tool to find the lowest rates on flights, hotels, vacation packages, and more travel deals.